The perfect gift for a lover of great food! Your Lagoon Gift Voucher is customisable with your personal message, and will be emailed to you within 24 hours of ordering (usually much faster!). Gift vouchers have no expiry date and are partially redeemable so can be used across multiple visits. If you would like a physical gift card, please visit us in the restaurant to purchase. The perfect gift for a lover of great food! Your Lagoon Gift Voucher will be emailed to you within 24 hours of ordering (usually much faster!) and are customisable with your personal message. They have no expiry date and are partially redeemable so can be used across multiple visits. Sensational Autumn Seafood Platter Offer! 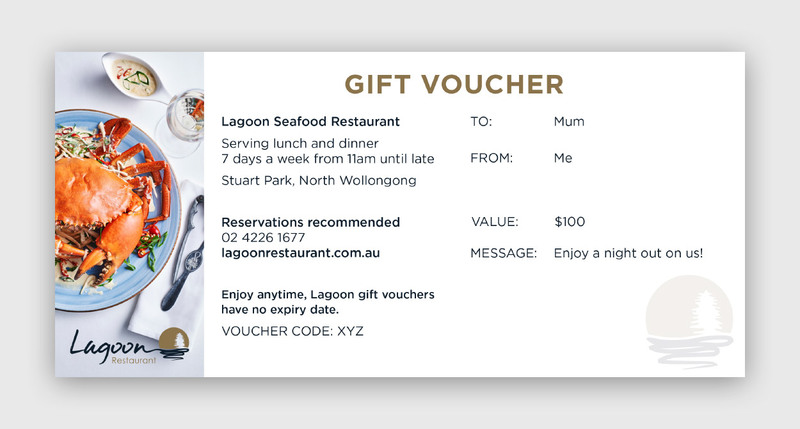 Win a $100 Lagoon Seafood Restaurant Gift Card!